Style: Vintage OTA analog Filter. Technical: JRC13700 OTA IC, saturation IC JRC 4558. This is an analog filter with a lot of low end. The design uses a JRC 13700 OTA dual vca chip to produce 12db Low pass and 12db high pass filtering. The module can easily self oscillate. There is a trimmer to adjust how much sine wave you want. There is a 2 channel internal mixer, so that you can patch two sound sources. There is a bi polar FM input, and a 'MOD' input with level control. These are used to voltage control the Cutoff knob. The 'ping' input is a unique trigger conditioner that will send a spike to the filter. This is used to produce percussion type sounds from the output. This is used in combination with the Rez knob. 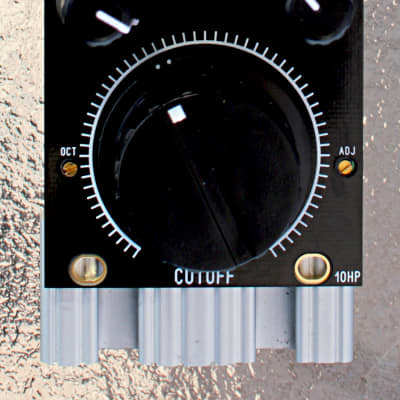 The cutoff knob determines the sine wave frequency.